An article on elpais.com and translated by Asia London Palomba - Three new prehistoric hand prints found inside Altamira cave in Spain - reports on the discovery made during the course of inventory work inside the world-famous Palaeolithic site. Painted hands in the cave of Altamira. Image: Getty Images. Members of the Museum of Altamira's research team and managers of the Handpas project, a venture that documents and spreads images of Paleolithic hand representations in Europe, have found three new hand prints on the walls of Altamira cave, in Spain's northern Cantabria region, that "almost certainly" were done more than 20,000 years ago. 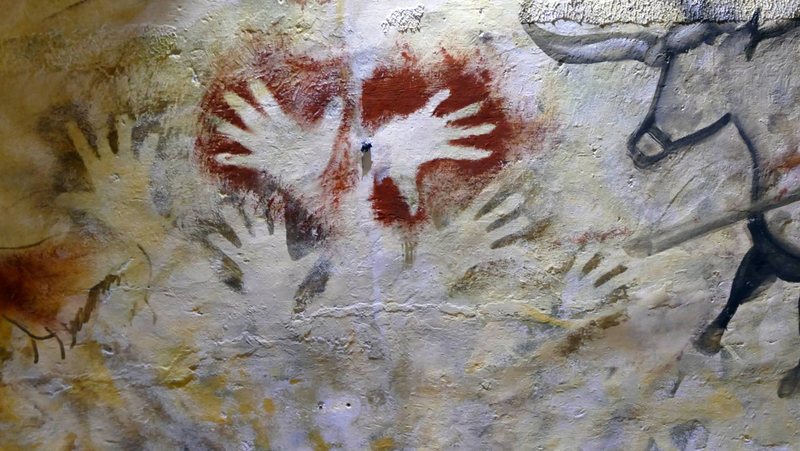 The three painted hands, reportedly in bad condition, add to the six that were already known to exist in the cave of Altamira. The three were identified during the course of documentary and inventory work within the cave. After they were discovered, the hands were digitally photographed and added to Handpas' 3D catalogue of Paleolithic hands in Europe. The collaboration between the project and the museum was announced by Pilar Fatás, director of Altamira Museum, by her deputy Carmen de las Heras, and by the director of Handpas, Hipólito Collado, who is also head of the archaeology department of the regional government of Extremadura. Eight of the painted hands are located on the ceiling of Sala de Polícromos (Polychrome Room) between horse representations, and the other one is in the Galería Final, the furthermost space located over 200 meters from the cave mouth. This particular work of art, whose existence had been known since the 1980s, but which had not been properly analyzed, is different from the rest. Apart from being a print rather than a stencil, meaning that the full hand was painted and used to make a print, it is also the hand of a child. Painted a deep black, it is "quite exceptional" as very few hands of this size have been documented, says De las Heras. 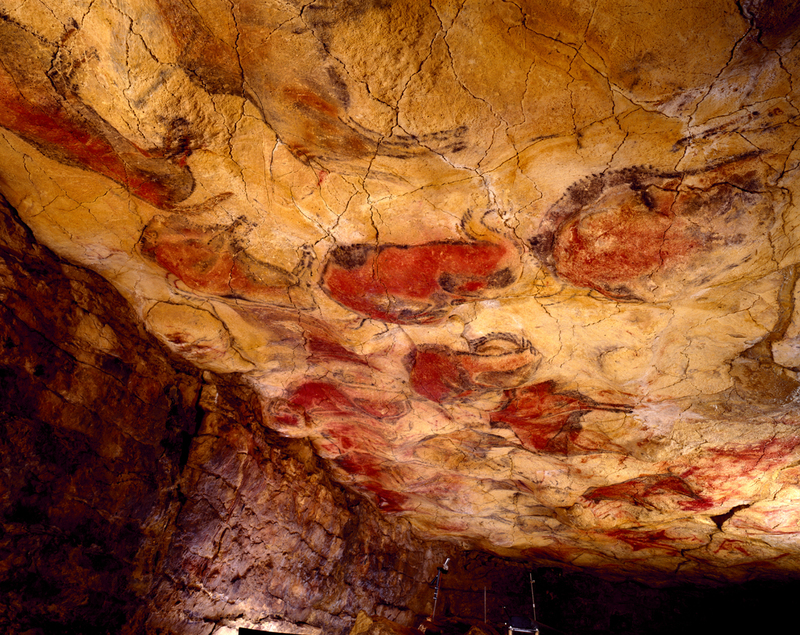 Polychrome ceiling in the cave of Altamira. © Museo de Altamira. Photo P. Saura. The others, located in the Polychrome Room, vary in color, ranging from a dark violet to an intense red. Although it is not known for sure, De las Heras believes that the hands are superimposed on the images of horses. According to data obtained and analyzed by Collado, 70% of the prehistoric population was right-handed. The importance of the discovery is not just in the number of prints discovered, but also in the way this section of the cave would have looked before the famous bison painting. De la Heras adds that "Thirty-two years after the last publication on the art of Altamira, the cave continues to produce relevant findings that never cease to amaze us and show us its greatness." The Museum of Altamira has showcased a documentary called 'Handpas, manos del pasado' (Handpas, hands of the past), which aims to provide answers to many of the questions raised by the prehistoric art. The documentary has been shown at multiple international science film festivals.